JS 8423, formerly Datong Works shunter JS 9999, was lurking in the shed at Yamansu when we visited. In spite of some suggestions to the contrary it is a standard JS"B" locomotive. The distant peaks of the Tianshan, rising to 4000 m above sea level, tower over the pit at Sandaoling. The red rock formations on the far side of the pit and the distant snow capped peaks reminded me very much of Arizona. The sun had dropped below the horizon at Sandaoling but continued to shine on the Tianshan mountains for a few minutes longer, enabling a silhouette to be taken of JS 8195 propelling spoil onto the westernmost tip. 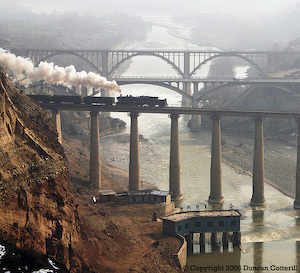 In conditions typical of our time at Yaojie, SY 0681 crossed the viaduct over the Datong River at Haishiwan. The other bridges in the picture carry the main road and the Lanzhou - Xining railway. 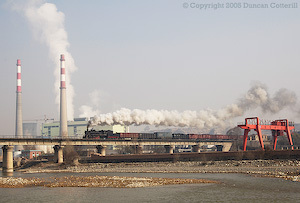 SY 1097 worked a freight bound for the Liancheng aluminium smelter over the Datong River bridge north of Yaojie, passing the power station on the outskirts of the town. Late November was not the best time to visit the Baiyin operation. The morning passenger to Shenbutong ran to early to catch the sun and the afternoon passenger was too late. This was just about the only place in the gorge north of Sanyelian where the afternoon train could be photographed in light. SY 0965 was doing the honours on 25 November. On the one day that a freight worked to Shenbutong in daylight, the pollution from Baiyin blew up the valley ahead of the train. SY 1581 was photographed in the gloop near the top of the climb on 26 November. We visited several recently discovered industrial and local lines in Xinjiang and Gansu provinces in the north west of China during November 2005. Our group comprised Peter Breeze, Dave Whitfield, Ian Martin and myself. Arrangements in China were made through Sun Xiaolan, who accompanied us throughout. Ian, Dave and myself flew from Heathrow to Paris where we joined Peter for the Air France flight to Beijing. Also on board was a Steam & Safaris group en-route to see the circus at Jingpeng. After arrival, we were met by Xiaolan and, following an extremely long and very leisurely lunch, transferred to terminal 1 for CZ 6902, the 15:05 flight to Urumqi (Wulumuqi). Our departure was delayed several times before we finally pushed back from the gate at 16:05. It was 16:40 before we got to the runway and took off. Arrival at Urumqi was 90 minutes late, leaving us little time to get to the station to catch train 1046 at 21:23 to Hami. We eventually arrived at the station at 21:24. Fortunately the local guide in Hami had arranged to transfer our tickets to train 1014 at 23:35, arriving Hami at 07:17 the following morning. Even more fortunately 1014 had available soft sleepers while we would have been in hard sleeper on 1046. After arrival, we travelled down to Yamansu, stopping off at Shankou to check that there wasn't a train already en-route. The mine at Yamansu supplies iron ore to the Bayi steelworks in Wulumuqi. Yamansu was very quiet with JS 6495 in light steam outside the shed and JS 8028, 8423 and 8152 cold but serviceable inside. The tender of JS 5465 and a set of driving wheels and connecting rods were all that was left of the dumped locos reported here. JS 8423 (formerly Datong Works shunter JS 9999) was confirmed to be a standard JS 'B' with 1987 plates and single slidebars. There were no wagons, loaded or empty, at Yamansu and nothing was expected to move before 16:00 at the earliest, meaning the likelihood of getting a train in daylight was slight. Rather than sit around all day, we decided to go to Sandaoling for the afternoon. This isn't one of the world's greatest lines but its close proximity to Hami makes it worth a visit if you are going to Sandaoling anyway. The line runs through some of the most barren territory on earth, completely devoid of even the scrubbiest vegetation, so some unique pictures can be had if you are lucky enough to find a train. Like the opencast pit at Jalainur, this is one of China's great steam spectacles with over 30 locos working in a superb industrial setting. Unlike Jalainur, the best action isn't in the opencast mine itself but at the western exit from the big hole around Xibolizhan, where the spoil trains emerge from the pit and climb onto the tips. At times the action here is intense with trains every five minutes or so. Loaded trains are propelled out of the pit by chimney first locos so the purists wouldn't be happy but there's still plenty of scope for rewarding photography. In such a dramatic location the direction that the locos are facing is of secondary importance. Elsewhere, it's possible to photograph spoil and coal trains being loaded and unloaded, to see flangers in action without having to brave winter conditions on Donner Pass and to catch banked trains of empties working up from the CNR interchange under the snowcapped peaks of the Tianshan. As noted by previous visitors, there are separate surface (Transport Division) and opencast operations here. The Transport Division is responsible for taking coal from the output side of the washery and the two deep mines, Beiquan Yijing (No 1 shaft) and Erjing (No 2 shaft), to the CNR interchange at Liushuquan. Operations are based at Nanzhan - see Bernd Seiler's excellent map. There seemed to be two, or occasionally three, trains each day in daylight hours from Nanzhan to Liushuquan and back but times varied from day to day. Trains of empties from Liushuquan were usually banked unless they were very short. Contrary to previous reports, we didn't see a single train of empties worked through to the Beiquan mines. Every train terminated at Nanzhan and was broken up there and tripped to the washery or deep mines. Again, contrary to the observations of earlier visitors, more coal seemed to be coming from the opencast mine than from the deep mines. Locos permanently allocated to the Transport division could be recognised by their smokebox door mounted headlights. Opencast division locos have their headlights mounted at the top of the smokebox so they are effective when propelling. 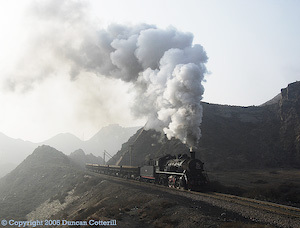 All locos worked chimney first out of Liushuquan and chimney first away from the Beiquan mines. The line from Liushuquan is uphill almost all the way but there is only a very short stretch of uphill leaving Beiquan No 2 Mine, with the rest of the line to Nanzhan being downhill. The majority of working locos belong to the Opencast Division. Around 20 locos run semi permanently coupled to rakes of 10-12 air operated side tipper wagons with a control cabin at the opposite end of the formation to the loco. When propelling, the operator in the cabin signals to the loco driver using a small semaphore signal mounted on the roof of the cabin. 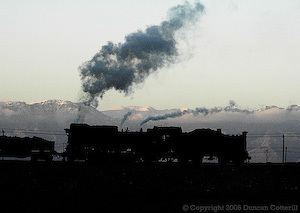 Most locos are coupled with the smokebox to the train but occasionally locos turn up facing the right way round. Most of these tipper sets are employed on spoil duties, transporting overburden from the big hole to the spoil tips on the southern and western edges of the site. 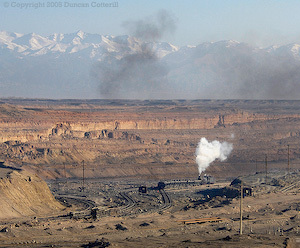 The vast majority of spoil trains emerge at the western end of the pit and dump at one of the seven tips near Xibolizhan. A few trains come out of the east end and dump near Dongbolizhan. Occasionally trains emerge from one end of the pit and run around the southern perimeter to dump at the opposite end. Trains are invariably propelled onto the tips. At shift change time Xibolizhan was incredibly busy with as many as 8 or 9 spoil trains lined up in the yard. Around three or four locos are used on coal trains from the pit to the washery. These use identical rakes of wagons to the spoil trains and are always propelled out of the western end of the pit. In addition to the spoil and coal duties Xibolizhan and Dongbolizhan each have a loco working with a flanger, compacting the dumped spoil on the tips. Another three or four locos work construction trains around the site and one of these also handles the passenger train, formed of a couple of boxcars. The morning passenger worked to the times indicated in Bernd's report but the working was a bit more involved than previously indicated, running Dongbolizhan - Xibolizhan (reverse) - station in pit - Xibolizhan - station at foot of spoil tips west of Xibolizhan (reverse) - Xibolizhan - Dongbolizhan. As with most trains, the passenger was propelled in one direction and pulled in the other but the loco was usually coupled tender to the east end of the train making it a chimney first hauled train on its return to Dongbolizhan. In total, we saw no less than 31 different locos in action. The two SYs were used on construction duties and the JSs handled everything else. The office at Dongbolizhan has a large board on the wall with all the opencast division duties marked on it. Metal tags hung on nails adjacent to each duty show the number of the loco allocated to each job. Some of the numbers shown on spare tags didn't correspond to locos in use, in store or under overhaul and presumably relate to engines that have been scrapped. 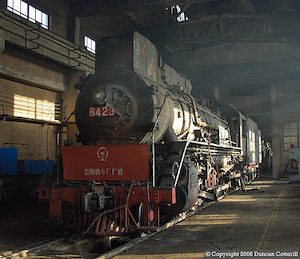 Locos had been sent to Tianshui works, east of Lanzhou, for major overhauls but this has now ceased. CNR will ban the movement of steam locos over this route from the end of 2005. The good news is that machinery and craftsmen from Tianshui are being moved to Sandaoling where a new repair facility will be established. A number of overhauled locos are in store to cover the period until the new works is up and running. JS 8193, previously reported as scrapped, is one of these stored engines. The confusion probably arises because there is a cab numbered JS 8193 dumped outside the workshop. We also found two cabs numbered JS 5708 on site but no loco. We were told that the mine plans to continue using steam for another twenty years. While this may be optimistic, there should still be steam here for another few years at least. We had official permission to visit the mines and were accompanied throughout by a local guide from Hami and a helpful official of the Coal Mining Administration. Independent visitors should be careful. Our minder told us that a number of enthusiasts caught in the mine area without permission had had their film confiscated and in one case someone had been fined 2000 RMB. Our first night was in the Hami Hotel in central Hami and the next two nights were spent in the comfortable Yinhe Hotel in Sandaoling. Minutes after checking in to the Yinhe Hotel, the police arrived to check our documents were in order. We had intended to stay a third night at Sandaoling but the hotel was being used for a meeting of the big chiefs, so we had to return to Hami for the final night. Opencast Division (in use) : JS 6203, 6206, 6208, 6209, 6223, 6224, 6259, 6430, 6436, 8055, 8076, 8077, 8078, 8081, 8089, 8189, 8190, 8194, 8195, 8197, 8221, 8314, 8368, 8384, SY 1593, 1718. East of Hami a number of freights were seen, mostly with DF4C haulage, although there were also a few DF8B+DF4C double headers. All the DF4C seen were in all over blue livery with yellow striping but the two we got close enough to identify were Ziyang built 5xxx locos. I've only seen these in the standard light blue and cream colours before. Westbound passenger 1082/3 was also seen with a DF11. The DF11, DF8B and the two DF4C we saw close up were all Hami locos (Wu Bureau, Ha Section). West of Hami, numerous freights with green DF4B and a few with blue DF4C were seen but only from a distance. We travelled on train T194, the Urumqi - Hankou express leaving Hami at 20:23. The train arrived behind DF11 0217 but probably changed to another DF11 at Hami. At dawn the next morning we were rolling down the gorge above Pingkouxia behind DF11 211 and DF11 194. All freights seen were hauled by pairs of DF4, probably the same locos that displaced QJs from this route in 1992. The main line from east of Pingkouxia, through Hexipu (Jinchang), to Wuweinan was in the process of being electrified with the poles up along most of the line. There was no sign of locos from the Jinchang industrial operation at Hexipu, just a CNR DF5 pilot. However our driver at Haishiwan said that there was still steam at Jinchang. At Wuweinan, an SS7C replaced the DF11s for the run over Tianzhu to Lanzhou. The original single track line from Wuweinan to Longgou has been completely replaced by a new, heavily engineered, double track route, much of which is in tunnel south of Gulang. At Longgou the northern portal of the new 30 km base tunnel being built under the mountains to Dachaigou could be seen. We rejoined the original single track route there. This is a fantastic line with 1 in 50 gradients, viaducts, horseshoe curves and tunnels climbing to a summit 10,000 ft above sea level south of Wushaoling. Although it is undoubtedly one of China's most spectacular railway lines, it will probably be ripped up when the new tunnel opens. Unfortunately, the views in the tunnel are unlikely to be as pleasant as those we enjoyed. Freights between Wuweinan and Dachaigou were hauled by SS1 or SS3 electrics, double headed in all possible combinations. South of Dachaigou the original route gave way to a new double track line again. Freights were hauled by single SS1s or SS3s. From Lanzhou, we continued by road to Haishiwan, taking just under 2 hours for the journey. We stayed in the adequate Lianhai hotel, close to the station in Haishiwan (shown on Louis's map). This line connects two coal mines at Yaojie with CNR at Haishiwan, 12 km to the south on the CNR main line between Lanzhou and Xining. The line also exchanges traffic with the Liancheng Tiehejinchang Railway at Yaojie. The loco depot and centre of operations are at Yaojie. Traffic consists of coal going south from the Yaojie mines to CNR and empties returning, coal going north from Yaojie to the Liancheng line and empties returning and through traffic between CNR and the Liancheng line. The town of Haishiwan is also known as Honggu but as the station, my maps and the signs on the motorway all refer to Haishiwan, you won't see any more references to Honggu here. Most of the coal from the Yaojie mines headed north to the Liancheng line, with only a small quantity heading south to CNR. Much of the traffic from Haishiwan to Yaojie was also destined for the Liancheng line and included some coal as well as other goods in boxcars or tankers. Train times weren't quite as predictable as Florian reported and workings would often be light engines in one direction or the other. On most days there was an early morning working, an early afternoon working and often a late afternoon working as well but we only saw one banked train, the rest were light enough to be worked by a single engine without any difficulty. We got the impression that there wasn't a plan but trains ran as required. The Yaojie controller appeared to dispatch trains at short notice after enough wagons arrived at Yaojie or Haishiwan. The line has plenty of photographic potential, particularly in the gorge south of Yaojie. Unfortunately, the trains tend to run at times that make it difficult to get the shots in the best light. However, the biggest problem is the appalling smog that hangs over the whole area, reducing visibility to less than a kilometer for days on end. There may be dramatic mountain backdrops to many shots but you just can't see them. Only two locos were steamed on most days, SY 0681 for the trips to Haishiwan and SY 0990 for shunting around Yaojie and trips to the collieries. A third loco, SY 0362 was steamed once and ran to Haishiwan, paired with SY 0681, but it wasn't seen in use afterwards. The fleet of 6 SYs includes SY 1713, one of the few engines built by Tongling Works. All the locos had been overhauled at Baiyin within the last two years or so and faced south as expected. The controller at Yaojie thought that the dumped JF there was JF 1563 but wasn't certain. He said it had been out of use for around 10 years. He also told us that the first diesel would arrive during December and they would have four diesels by the Spring Festival. The reason given for dieselisation was the difficulty in getting locos overhauled. It seemed strange that a system with two ex-works locos would go for such rapid dieselisation but strange things happen in China. This line connects with the Yaojie line at Yaojie and runs north to the Liancheng Aluminium Smelter and Power Station, 8 km north of Yaojie, and the Tiehejinchang Ferro-Alloy Plant, 27 km north of Yaojie. The controller at Yaojie confirmed that this was a separate railway to the Yaojie operation. There is considerable confusion over the names of towns along this line. Whenever we asked where we were, we were told "Liancheng". Liancheng appears to refer to anywhere north of Yaojie on the west side of the river. The name "Liancheng Aluminium" is displayed prominently over the main gateway of the smelter and it is assumed that the nearby power station is the "Liancheng Power Plant". The other power station in the area, at the north end of Yaojie adjacent to the river bridge, is not rail served. A search on Google gives the address of the smelter as "Jianshepeng, Heqiao". Heqiao is certainly the name of the town on the opposite bank of the river from the smelter and is displayed on road signs. We saw no reference to Nanlingcheng at the northern end of the line but a couple of businesses in the town marked as Nanlingcheng on Louis Cerny's maps displayed signs reading "Tiehejinchang Branch". Tiehejinchang literally translates as "iron alloy factory" but appears to refer to the adjacent town as well as the industrial plant. The loco depot manager at Fengluo demanded 100 RMB per person for us to visit. We refused and looked over the wall at the back instead. We also got the impression that the Smelter, Ferro Alloy Plant and Power Station were not keen on unofficial visitors either. One loco appeared to be based at the smelter and tripped between the yard there, Yaojie and the power station as required. There would often be a mid-late morning trip to Yaojie, returning late morning to midday. Although turnrounds at Yaojie weren't as rapid as Florian indicated, locos generally returned north within an hour or so. Another loco was based at Fengluo and tripped north to Tiehejinchang and south to Yaojie as required. We were told that there was usually a midday trip to Tiehejinchang and a mid afternoon trip to Yaojie. It is possible that the trips to Tiehejinchang are propelled as there appear to be no run round facilities there. The loco fleet comprises no less than seven SYs although only two appeared to be required at any time. All locos faced north as previous reports indicated. We couldn't find a cement works at Haishiwan but we did find the branch shown on Mike Rhodes' map leading from the east end of Haishiwan station in a south-westerly direction. The line was obviously in use but hadn't seen a train for a few days, judging by the state of the rails. There were no railway officials to ask but one old man did indicate that occasionally steam did work to a factory down the branch. Others mentioned only diesels. Most passenger and freight trains on the Lanzhou - Xining main line were hauled by green DF4s. We saw a number of early examples including DF4 0114, 0130, 0220 and 0630 (DL 1983), all Lanzhou Bureau, Xining Section, but most locos seen were of the more modern DF4B variety. Train T655 from Lanzhou to Xining was seen several times formed of a double deck inter-city DMU set with class NZJ2 power cars at each end. We travelled by road to Liujiaxia via Shangxuan. Accommodation at Liujiaxia was at the Liudian Hotel just east of the station, notable for its chaotic plumbing and rock hard beds. As first noted by Hsiang Tseng in September, local railway steam locomotives no longer run through to Hekounan but hand over freight traffic to a CNR diesel at Shangxuan. There is no passenger service north of Shangxuan but the mixed still runs south of there. Unfortunately it doesn't come back any earlier than before and runs in darkness for most of the year. If it's difficult to get the best shots around Yaojie, it's next to impossible here. The scenery in the Yellow River gorge is superb but the timing of the only daylight train is far from ideal and poor visibility masks the spectacular mountain backgrounds. Previous visitors have reported the early morning and midday "school train" shuttles between Gucheng and Liujiaxia but there is also a late afternoon train running as detailed below. The mixed (8794 & 8791) and its positioning workings (003 & 004) run daily but the other trains may not run at weekends. Liujiaxia 07:48 12:00 13:48 17:50 21:10? The shuttle train loco shunts various sidings around Gucheng in the morning to collect wagons for the afternoon mixed to Shangxuan. There doesn't appear to be any freight traffic from Liujiaxia itself. The line from Liujiaxia to the dam is still in situ but doesn't appear to have seen any traffic for some time and is blocked by a huge pile of coal just beyond Liujiaxia station. The loco fleet consists of four of the newer JS class locomotives, of which two are required at any one time. To complicate matters, two of the locos have been locally renumbered with the same numbers as the other two, so JS 8226 was masquerading as a second JS 8223 while JS 8352 pretended to be JS 8227. Note that JS 8226 was running with the JS 8227 plates when Peter Semmelroch visited the line earlier in the month. The real engines have painted cabside numbers while the imposters carry aluminium framed plates. Their real identities can be determined from the stamped numbers on the air receivers. Our journey by road revealed nothing of interest. We stayed at the plush Wansheng Hotel in Baiyin Xi, the area currently being developed to the west of Baiyin. Baiyin itself is a company town owned and run by the Baiyin Non-Ferrous Metals Company. The complex consists of four mines and four smelters plus associated chemical works and power plants. Most are located in an industrial area to the east of Baiyin city but there are mines just north of Shenbutong, around 17 km north of Baiyin and a Lead/Zinc smelter at Sanyelian, 7 km north of Baiyin. The line to the north runs through open country at first before entering a narrow gorge north of Sanyelian. Although the countryside south of Sanyelian is open, it is not particularly attractive with many poles, pylons and spoil tips disfiguring the landscape. North of Sanyelian is much better but sees fewer trains. The gradients on the line are steep, up to 1 in 50 against northbound trains, and locos work hard all the way from the CNR bridge just north of Baiyin. Although the line to Sanyelian leaves the main route to Shenbutong at Liugongli, both lines run side by side all the way to Sanyelian, giving the impression of double track. The passenger stop sometimes referred to as Sanyelian Upper on the Shenbutong line is adjacent to the platform at Sanyelian (Lower) used by passengers that terminate at the Smelter. We did not find Dongchanggou station in spite of walking the line from Sanyelian much of the way to Shenbutong. Within the complex there is an extensive network of lines serving the various plants in the area. We did not explore the complex beyond the yard at Gongsi. Trains entering Gongsi yard from the complex face a stiff climb after passing under the through north-south line (shown on Mike Rhodes' map). Like Liujiaxia and Yaojie, visibility in the area is generally very poor. The passenger services have been retimed slightly. The current timetable is thought to be as shown below. Some of these timings are inspired guesswork and should not be relied upon. The morning Sanyelian turn does not run at weekends but the afternoon train does. Note that some of the Shenbutong trains may not stop at Sanyelian. Everyone we spoke to referred to the passenger station adjacent to CNR's Baiyin Shi station as Xinzhan. Freight traffic on the line to Sanyelian and Shenbutong was sparse. There were no ore trains from the mines at Shenbutong until our fourth day on the line. We were told that the ore empties normally went north between 09:30 and 10:00, after the morning passenger had returned from Shenbutong, but we only saw the train once at this time. There was also said to be an evening working on some days. Sanyelian was usually served by one daily freight working but it usually ran around midday or early afternoon. As the line runs south-north, this train was almost impossible to photograph on it's outward journey and downhill on its return. Most of the freight activity is in the complex itself. Frequent workings from Gongsi yard serve the various plants located to the south and east. Traffic to or from CNR is handled by CNR diesels, which work into Gongsi yard from Baiyin Shi. We saw DF4 and DF5 used on these workings. Locos faced in both directions but those used on trains to Shenbutong were always chimney first uphill. Those on the Sanyelian workings and trains within the complex faced in either direction at random. Locos were in good condition and generally fairly clean. SY 2008 was of interest as it is one of the batch built at Jinan during the early 1990s. however it carries a plate with a 1973 date, possibly a Tangshan one. Unfortunately we weren't able to determine whether the plate or the loco number were correct. Like Sandaoling, this is another operation where official permission is required to visit many parts of the line. The industrial part of Baiyin, including Gongsi station, yard and loco depot is not a public area and unofficial visitors have been fined and have had their film confiscated. Access to the gorge on the line to the north is via the smelter at Sanyelian, another area where official permission is definitely required. We had to get clearance from both the Public Security Bureau and the railway for our visit and we were accompanied by a security official during the first couple of days of our visit. We found that our permission only covered the area north of the main complex and not Gongsi Yard, the locomotive depot or any of the lines within the main complex. To visit Gongsi cost extra and even then our minder prevented us from photographing from the sunny side at the east end of the yard, supposedly because it was not safe! He also fed us with misinformation about train operation and then offered to specially arrange trains that were going to run anyway, for a suitable fee of course. When it became clear that we were not going to be taken in, he got bored with us and went away. After that, things got much easier and we even got to where we wanted in the yard using the previous day's permit. Independent visitors should be aware that there are checkpoints approaching Sanyelian and police patrol regularly within the main complex, including the area around Gongsi. The area between the complex and Sanyelian appears to be accessible without a permit. We found this a very difficult operation to photograph successfully. The most obvious attraction was the passenger service on the line to the north. However, the morning uphill trains ran before the sun got over the horizon, let alone the ever present layer of pollution, and by the time the afternoon trains ran, most of the line in the gorge was in shadow. In the seven hours or so in between the uphill passengers, there wasn't a lot to do. With little to do in Baiyin after the morning passengers (the ore train did not run on the 27th), we travelled to Lanzhou (so Ian could photograph the trolleybuses) then headed for the airport for our flight to Beijing. We arrived at 16:25, in good time for the 18:00 Air China flight. Unfortunately, the plane was severely delayed and didn't depart until 22:50, almost 5 hours late. Surprisingly, an Air China official apologised to passengers as they boarded and handed out 200 RMB compensation to each person. We arrived at Beijing just before 01:00 and, somewhat weary, transferred by courtesy bus to the Beijing Airport Hotel for what remained of the night. Our original plan was to return to the UK on the 27th but Air France cancelled our flight so we extended our stay at Baiyin by a day and flew back on the 28th. This wasn't an easy trip with unseasonably warm temperatures in Xinjiang causing the exhaust to disappear by lunchtime, travel arrangements disrupted by flight changes and delays and appallingly poor visibility in the Gansu smog belt. In spite of all this we did get some worthwhile pictures on all the lines visited except Yamansu and Liujiaxia. Sandaoling was undoubtedly the highlight of the trip with good visibility and plenty of action in a spectacular setting. It will definitely be on the agenda for another visit at sometime in the future. None of the other lines really inspired though. They were worth visiting once but there is little incentive to go back even if the opportunity arises. Indications are that Yaojie has already decided to go for diesels and the Tiehejinchang and Liujiaxia operations can't survive for long without access to overhaul facilities. The future seems brighter at Baiyin but the access restrictions, low traffic levels outside the complex and poor visibility don't make it the most attractive destination. 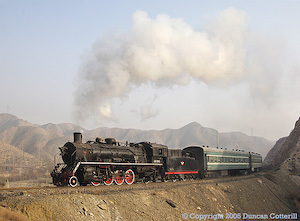 It is becoming increasingly clear that the most significant factor in the decline of steam on China's industrial railways is the attitude taken by CNR to steam locos running on state railway lines. Apart from preventing operations like Liujiaxia from working trains over CNR track, it is preventing virtually every line from sending locos for overhaul. Many systems can do intermediate repairs themselves but the boiler work required during a heavy overhaul is beyond the capability of most railways. Without access to proper overhaul facilities, no line will be able to keep its steam locos operable for more than two or three years. Fortunately a few of the bigger systems are taking steps to ensure they can fully overhaul their own locos on site. That should ensure some working steam in China for a few more years, but only on a handful of systems. We are lucky that top quality systems like Sandaoling and Jixi are likely to be among the few survivors. The majority of lines are doomed to dieselisation or closure within the next year or two. The end is also approaching for the railway over Tianzhu, probably the highest main line railway outside South America and undoubtedly the world's busiest line to reach 3000 m above sea level. This is a remarkable piece of railway and the only line that I've visited in China that is more spectacular than Jingpeng Pass. It may have been electrically worked since 1992 but it will be sad to see it go when the new tunnel opens. The time is fast approaching when it will be difficult to justify visiting China for steam alone. There just won't be enough lines left to enable a sensible itinerary to be drawn up. Perhaps a trip to see the last electrics over Tianzhu won't be too far away. None of us had visited any of these railways before but we quickly found our way around without too much difficulty thanks to the information and maps provided by previous visitors. Bernd Seiler's map of Sandaoling and Louis Cerny's Yaojie maps deserve special mention in this respect. Thanks guys and keep up the good work.